The MT0404-MWM is a high performance, high speed HDMI/VGA video processing system that can be easily configured and controlled for three different output modes (Matrix, Video Wall and Quad Multi-Viewer) for various applications. 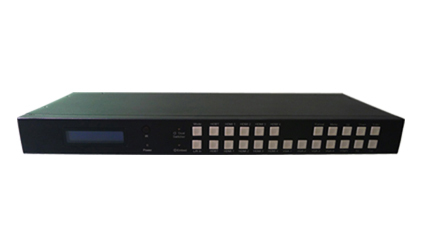 The MT0404-MWM can perform as a matrix switcher, a 2x2, 4x1 or 1x4 video wall, and also features quad multi-viewer options. It supports full range of video resolutions up to 1920x1200@60Hz (WUXGA) or 1080p. Three modes: Matrix 4x4, Video Wall 2x2/4x1/1x4 and Multi-Viewer with 4 preset layouts. HDMI input resolution up to 4K@30Hz 4:4:4. VGA input resolution up to 1920x 1200@60Hz. HDMI output fixed at 1080p@60Hz.